Take a journey through weADAPT! Home › Learn › Articles › Take a journey through weADAPT! Welcome to our user journey page! This is where you will find narrated videos giving examples of different ways of navigating through the site according to your perspective and familiarity with it. 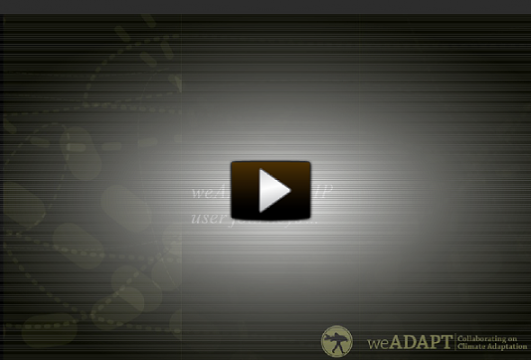 The first set of videos tells stories of weADAPT users who have varying of levels of fluency with the platform (beginner and advanced). The second set of videos will frame their interaction with weADAPT through their own specific mandates and professional objectives. Alex is working on development projects in Indonesia. He is new to weADAPT and new to the topic of climate adaptation, coming from an international development background, quite junior, looking through the entry level content on how adaptation is different from but links closely with development at the local scale and how to build communication about climate risks and vulnerabilities into engagements with local development stakeholders his organisation works with in their projects. Andy is a researcher at the Climate and Development thinktank and is developing adaptation projects in a range of countries. He has already looked at the Climate Information Portal and is using weADAPT to understand how to deal with different types of uncertainty when planning his projects. He navigates through the Decision-Making initiative and finds training materials as well as a number of different tools which can be used to choose between different adaptation options. This is a journey through weADAPT and the Climate Information Portal (CIP) by Lydal who is a member of a small local NGO in northern South Africa. She works with rural farming communities in Limpopo province and she has been tasked with trying to source some useful information on the topic on this topic to present to the community. This is a journey through weADAPT and the Climate Information Portal (CIP) by Zara, a user from an international NGO, based in South Africa but supporting a food security programme in Malawi. She shows us her navigation through the 2 sites looking for information about the climate in southern Malawi, what farmers are doing to manage the impacts of climatic extremes and what other organisations are working on climate adaptation in the area. This is a journey through weADAPT and the Climate Information Portal (CIP) by Nathalie, an environmental economist at a development bank in Nairobi, Kenya. We follow her through the portals looking for content to prepare a national overview of climate risks, vulnerabilities and adaptive measures across Tanzania, in order to brief her colleagues in the investment strategy team.